Gunslinger Games will let North Texas hobbyists put their 40K Christmas presents on the game table Saturday, January 12, 2013, by hosting a Warhammer 40,000 6th Edition Combat Patrol Tournament! •Armies of 400 Points or less. •One core TROOPS choice mandatory. •One HQ choice optional (patrol leader may be a squad upgrade such as a veteran sergeant). •No Characters, Monsters or other unit types with more than 2 Wounds. •No Vehicles with combined Armour Value greater than 34 (front/side/rear AV added, ie a Dreadnought with 12/12/10 is patrol-legal). •Although there will be scoring of and prizes for Painting, participation requires only that used models be assembled, based and equipped as they will be played (ie with proper weapons and upgrades). •Play consists of three 50 minute games in succession--by tournament's end, hobbyists will have a working familiarity with the game and with the core of their army, upon which they can readily build. •Play begins after lunch and is finished before dinner! •Make a purchase at host Gunslinger Games of $10 or greater, sign up in-store, then confirm your registration and what army you will play at Outrider@AdeptusNorthTexas.com (or on the Adeptus email list). •Buy a participation entry from host Gunslinger Games for $10, sign up in-store, then confirm your registration and what army you will play at Outrider@AdeptusNorthTexas.com (or on the Adeptus email list). The Combat Patrol tournament will run from Noon till 4:30pm. Assemble you core patrol, be it an assemblage of grizzled veteran models, a shiny new addition to a familiar force, or an all-new, never-tried first excursion into the hobby, and let slip the dogs of forty-first millennium war, Saturday, January 12, at Gunslinger Games. Lone Star Comics will hold a one-day, ten-player campaign event Saturday, January 12, 2013, at their Arlington location, 1215 S. Cooper. The "Gathering of Heroes" will be a two-sided campaign game, with a maximum of five players per side, ten players total. Entry fee for the event is $35. This entry fee covers not only participation but also prizes (including door prizes), gift grabbags and a lunch. 1500 point maximum for each player. At least one named character in each army. NO Fortifications, due to constraints of the Campaign which will be made evident in the course of play. Players will be expected to provide an accurate, legible army list legal to the above specifications, their source codex/army list and other rulebooks, dice, tape measure and any other items needed for their army. They will receive the campaign story packet on the day of the event. Players with any questions or who are interested in signing up for the event should contact moderator Jon Ansley directly at jonansley@lonestarcomics.com. Good luck to those 40K commanders who opt to report for the "Gathering of Heroes!" Michael Sanford and teammate Will Davis also went undefeated to be named Best Generals (Grey Knights/Salamander Space Marines); Eric and Alexz Smelley (Dark Eldar/Space Wolves) had Best Army List; those two teams tied to finish Third Overall, with Josh Sherman and Brady Allen (Jade Legion Space Marines/Tyranids) finishing Runner-up Overall Team. Level of play was very high, reflected in close games through all three rounds--and above average Sportsmanship scores for virtually the entire roster of teams. That's well-known as a point of emphasis for events I moderate--play which results in players having fun keeps players in the hobby--but it created a real logjam at the top for the Best Sportsmen prize: when bonus points for being named Favorite Opponent were added to each round's score, three teams were tied for high score, with three more only a single point behind. Winning team Barret and Chuck were the only players to receive maximum scores for each round, which broke the tie, but kudos to Chris LaJudice/John Saxin (Chaos Space Marines/Tyranids) and Josh Sherman/Brady Allen (tied for Best Sportsmen) and John Laird/Ben Chukmuwa (Space Marines/Blood Angels), the Smelleys and the Pistoles for finishing a single point off. Kudos to the community, as well: three teams cancelled at the last moment (one late Friday, two Saturday morning), yet enough players showed up in hope of playing that the event was still full, with late arrivals staying to play each other and even demo games for interested passersby/potential new hobbyists. It was a fun day of 40K. Finally, thanks to Gunslinger Games for hosting and providing over $120 of prize support; look for Games Workshop to continue to increase it's presence at the store, based on the success of these events. More of which to come--watch adeptusnorthtexas.com for details! 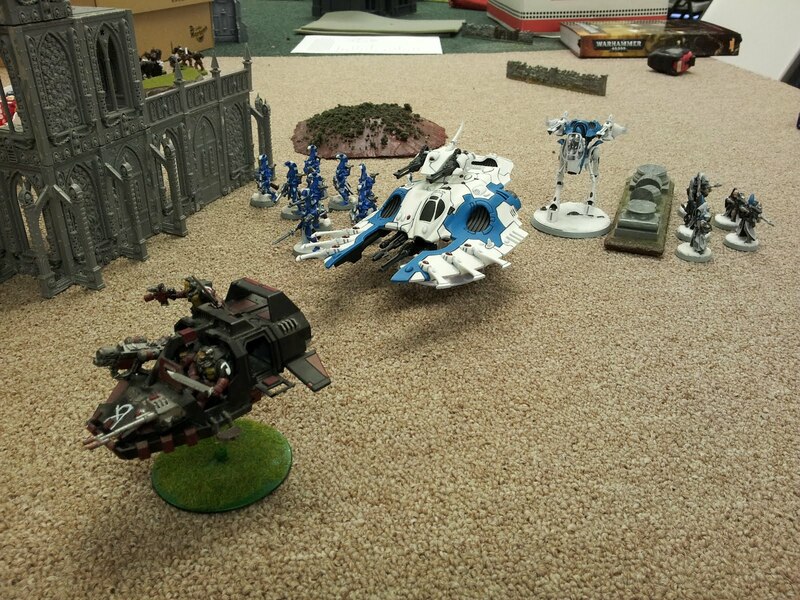 Gunslinger Games will host a Warhammer 40,000 6th Edition Doubles Tournament Saturday, October 20, 2012! Participation is strictly limited to available slots; teams may register as alternates when the event is full, with any slots which come available due to withdrawals or no-shows being filled in order of sign-up (if known in advance) or awarded by lot amongst alternate teams present day-of-event. Scoring will include gameplay/generalship, painting, army list (including graphic list presentation and background/fiction explaining the circumstances of the army alliance) and sportsmanship. Rally your forces and summon your most trusted allegiances; the time of battle across a united front has come...Saturday, October 20, from 10a-7p at Gunslinger Games! The 41st Millennium comes to the tabletops of Texas Toy Soldier via a Warhammer 40,000 Tournament Saturday, October 6th, 2012! This 1500 points, three-round event, moderated by TTS regulars, will run 10 am to 6 pm. Entry Fee is $10, or a $20 TTS purchase. To reserve your slot, contact Texas Toy Soldier! Also, Texas Toy Soldier announces their Fall 40K League which will begin Tuesday Sept. 25th, and will run thru the end of 2012. An escalation league (similar to their Spring League with minor adjustments), the league will feature a primary league night--Tuesday evenings--but with gameplay available anytime convenient for participants. Interested 41st Millennium commanders should contact TTS for details! Gunslinger Games hopes to recreate July's success by welcoming hobbyists to another opportunity to explore Warhammer 40,000 Sixth Edition Saturday, September 8 through a Combat Patrol Tournament--this one with an army composition upgrade offer! As before, players may sign up in advance at Gunslinger Games by either paying a $5 entry fee or making a $10 or more purchase; players may sign up on the day of the event for a $10 entry fee or by making a $10 or more purchase if slots remain. The event will run from Noon until approximately 4:30pm. Combat Patrol forces are traditionally 400-point-maximum, no Allies armies chosen from one in-print 40K Codex which *must* have at least one core Troops choice; the remainder of the Force Org can be chosen from a maximum of one HQ choice (maximum 2 Wounds, no 2+ Saves), vehicles with a maximum AV of 34 (adding Front, Rear and Side Armour [once]), and additional units of choice which do not exceed 2 Wounds and do not include 2+ Saves. A Combat Patrol Commander figure must be identified; this will be the HQ choice if taken, or a unit leader or other readily identifiable model, otherwise. Because codices--and in fact the core rules themselves--have undergone considerable revision since Combat Patrol tournament limitations were originally conceived, players may, for this event, alter the above-described traditional force composition in the following way: each player may select one character or unit for their Combat Patrol which exceeds Combat Patrol limitations--but the character or unit will operate for the duration of the tourney under said limitations. In other words--players may select, and pay the full codex points cost for, one character or unit which has more than 2 Wounds, but that character or all models in that unit will play at the event with a maximum of 2 Wounds (simulating pre-existing injury or debilitation); players may select, and pay the full codex points cost for, one character or unit which has a 2+ Save, but that character or all models in that unit will play at the event with a maximum of a 3+ Save (simulating armour breakdown or wear-and-tear); and players may select, and pay the full codex points cost for, a single vehicle which exceeds the maximum AV of 34, but that vehicle will play at the event with AV values of 12/12/10 or 13/11/10, whichever most closely approximates its actual AV (simulating sustained damage to the vehicle prior to battle). Most players will, of course, not opt to play these more expensive characters, units and vehicles at less than their peak efficiency, but for those whose particular codex dramatically limits their options--or who are willing to suffer the on-table penalty in order to field an army more consistent with their theme and vision--this twist offers considerable flexibility. Further exceptions to the standard Combat Patrol force composition limitations are possible but must be approved by the Event Moderator via the Adeptus North Texas emailing list in advance (the only likely candidate which occurs at time of this writing would be a player wishing to take an HQ choice in Tactical Dreadnought Armour with the special ability to then turn a squad of Terminators into a Troops choice, and thus field a Patrol of all Terminators, and something like this, being obviously thematic and cool, would likely receive a waiver allowing the second exceptional unit--but they would all be operating for the tourney with 3+ effective Saves, so said player is really going to have to like playing his Terminators...). Chosen HQ choices will be able to roll on the Warlord chart for this event if ordinarily eligible to do so. Fortifications may be chosen for this event as part of the player's 400 point force, as per V6 rules. The Fortifications are not subject to the AV limit. Participating players must have at least two printed, legible and accurate Army Lists with their names on the List, one of which will be turned in to the moderator for verification, table and opponent assignment before the first round begins. This was an area of considerable non-compliance in July; please take the time to complete this participation requirement for the September 8 event. Models must be primarily Citadel miniatures, fully assembled and properly, legally based; as an introduction to V6-oriented event, forces need not be fully painted *but* there will be a prize for the Best Painted Patrol and every effort will be made for players with painted armies to play opponents with painted armies. Prizes will be awarded as soon as final scores are tallied. Prizes will be awarded in the form of Gunslinger Games gift cards and entry fee waivers for future events! Games between any players who are also participating in the North Texas Norh'Tek Nebula V6 Campaign will count extra, and have special campaign conditions in play. Come spend an afternoon getting to know Warhammer 40,000 Sixth Edition Saturday, September 8 from Noon to 4:30pm, at Gunslinger Games' next V6 40K Combat Patrol Tourney! Commanders, choose your Patrols well! 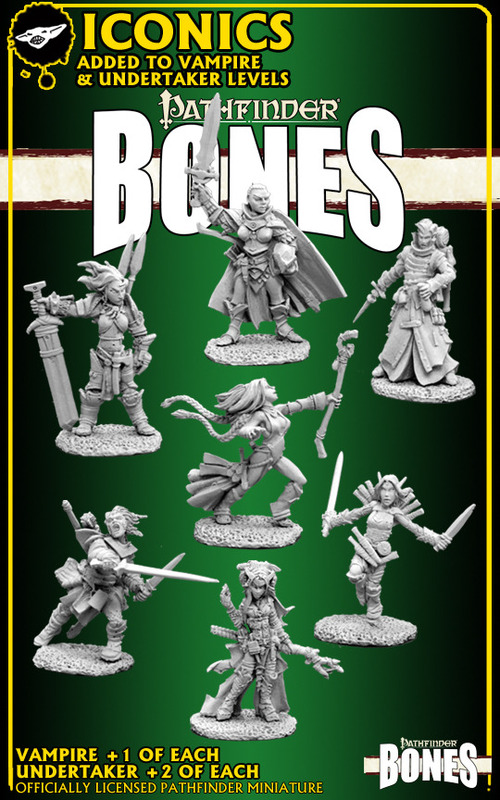 Reaper Miniatures is a North Texas-based company, and has long been a friend to the local gaming community (including prize support for events such as Astronomi-con Dallas); they have turned to the public-funding site Kickstarter for financing to greatly expand their 'Reaper Bones' line of unpainted plastic versions of their beautifully-sculpted, diverse, traditionally metal hobby figure lines, and have been embraced: with a week of funding left, they are approaching one million dollars raised. 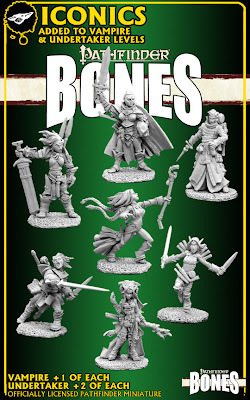 In response, they have set--and achieved--numerous goals, with the result that several pledge levels--specifically, the $100 'Vampire' supporter level--have so many miniatures available either as a direct pledge reward or as a purchase option that supporters will be getting model figures at well under a buck each, a huge discount over their eventual retail. Metroplex afficionados of one of GW Specialty Games' enduring successes can 'dabble' in Blood Bowl through the Dallas Area Blood Bowl League--DABBL--with information at http://www.dallas.bloodbowlleague.com ! Most games are centered at the GW Grapevine Mills, but the league is hoping to sponsor divisions at other area retailers; generate your 11 players, get the latest info at the league site, and experience action on the pitch in the Warhammer Old World! Enthusiasm was high, and considerable fun appeared to have been had; over $75 in prizes was a nice return for an afternoon's pitched battle (thank you, Gunslinger Games). Watch Adeptus for another, soon. V6 40K Combat Patrol Tourney, July 28 Gunslinger Games! Gunslinger Games will welcome hobbyists to Warhammer 40,000 Sixth Edition on Saturday, July 28 with a Combat Patrol Tournament from Noon till 4pm! Players may sign up in advance at Gunslinger Games by either paying a $5 entry fee or making a $10 or more purchase; players may sign up on the day of the event for a $10 entry fee or by making a $10 or more purchase. Combat Patrol forces are 400-point-maximum, no Allies armies chosen from one in-print 40K Codex which *must* have at least one core Troops choice; the remainder of the Force Org can be chosen from a maximum of one HQ choice (maximum 2 Wounds, no 2+ Saves), vehicles with a maximum AV of 34 (adding Front, Rear and Side Armour [once]), and units which do not exceed 2 Wounds and do not include 2+ Saves. A Combat Patrol Commander figure must be identified; this will be the HQ choice if taken, or a unit leader otherwise. The HQ choice will be able to roll on the Warlord chart for this event if ordinarily eligible to do so. Fortifications *may* be chosen for this event as part of the player's 400 point force, as per V6 rules. Participating players must also have at least two printed, legible and accurate Army Lists, one of which will be turned in to the moderator for verification before the first round begins. Prizes will be awarded as soon as final scores are tallied; the event should be concluded before 4pm. Prizes in the form of Gunslinger Games gift cards will be awarded for Tournament Champion, Best Sportsman and Best Painted Patrol. Games between any players who are also participating in the North Texas Norh'Tek Nebula V6 Campaign will count extra, and have special campaign conditions in play! Come spend an afternoon getting to know 40K V6 at Gunslinger Games Saturday, July 28 from Noon to 4pm, at the first Sixth Edition Warhammer 40,000 Combat Patrol! The Secret Door, a new North Texas GW retailer in the Midway Mall in Sherman, announces a Warhammer 40,000 Apocalypse event Saturday, July 14, at the Bryan County Community Center, Bryan County Fairgrounds, Oklahoma, to benefit 'Raising for Rylie'--a charitable organization funding a liver transplant for a six-year-old girl in need. A donation of at least $10 per player (with all proceeds going to the charity) earns participants the opportunity to bring a force of 1000 - 4000 points. Every 40K race is welcome, and while painted models are preferred the charitable nature of the event means all are welcome. Gameplay will begin at 10am. The event will also include a Raffle, an Auction, starter kit building demos, a model display, other fundraising activities--and food! Contact Andrew at The Secret Door with questions or for additional details, and rise to Rylie's defense July 14! The release of 6th Edition Warhammer 40,000 is upon us...and to renew enthusiasm for the Hobby and its storytelling and model-building--as well as gameplay--aspects, Adeptus North Texas and participating Metroplex retailers will follow it up with an expansive new ongoing campaign! War for the Norh'tek Nebula will see each participating store representing a planetary system; as the Nebula region of space roughly corresponds to North Texas, so each store system will be roughly contiguous to their location across the Metroplex. The campaign theme will be announced following the release of V6 details, but all 40K combatant armies will be able to participate! Campaign battles will be fought three ways 1) in participating stores; 2) at special events (tournaments, Nebula games days/Apocalypse megabattles) in participating stores; and 3) at home/clubs/anywhere else. There will be incentives to fight games actually in stores--for example, retailers who provide in-store playing space will represent a planetary system within the Nebula with a major planet, and all games played in-store will count toward control of that major body, while games fought elsewhere but committed to that system will count toward control of moons/minor planetary bodies therein--but *any* game played (and reported) by participating hobbyists can affect the ongoing campaign. This will allow participating stores which retail GW product but lack in-store playspace to still participate (though their planetary system may be a shattered planet or asteroid belt or somesuch similar lacking a major planet--since they cannot host the in-store game portion--if they can rearrange their store for the occasional special event they might get a special 'high priority' asset discovered to fight over, for example). The campaign is being announced well in advance of product release to allow hobbyists to take advantage of an additional campaign feature: players will be able to 'declare' a home planetary system by purchasing any version of the upcoming V6 rulebook or the eventual V6 starter boxed set from a chosen retailer--and any campaign games players win for their home system accrue extra benefits toward control of that store's system (representing investment of and/or control of high value assets, etc, such as any martial force might commit to maintain 'home base'). Hobbyists should thus consider in advance where they play most frequently, encourage that retailer to join the campaign, and then make their rulebook/starter set purchases there! All administering of the campaign will be done on Adeptus North Texas so interested hobbyists will need to be subscribed to the site's emailing list to report results and follow campaign events. Hobbyist participation will be rewarded with in-campaign benefits, as well: name your army's commander, write up your chapter's background, share a campaign battle report, use your graphic arts skills to help compose the Norh'Tek Nebula map (or your store's individual planetary system)--and post it to Adeptus for the community to share!--and you may see it reflected in ongoing campaign events. It is a time of change; it is a time of struggle. It is the forty-first millennium--and regardless of edition changes, one fact remains constant: in the grim darkness of the far future...there is only war! Follow the link to see if he completes his ambitious hobby goal! The North Texas Storm of Magic Modeling Event Series races to its climax with an opportunity to enter a spellcaster on a mount for Warhammer Fantasy Battle (see specifications following) at participating retailer Area 51 Grapevine. This is the final opportunity to accrue benefits such as rerolls, extra lives, extra spells and/or powerful magicks for models to use in the climactic Event Storm of Magic Megabattle at Gunslinger Games, a chance to take home great prizes in the doing--and a terrific opportunity to support a fine North Texas retailer and fill his display cabinets with sharp-looking fantasy miniatures! March 2012: Area 51 Grapevine -- Storm of Magic Mounted Wizard Painting Contest: Participants may submit an objective-claiming spellcaster model which must be riding a mount or monster option from it's entry in the relevant army book to Area 51 in Grapevine any time from March 1 through close of business Sunday, March 25 where they will remain on display through March 31. The submitted model may be a spellcaster from the chosen army book *or* a legal ally spellcaster from another army book as described in the Storm of Magic supplement. There will be *no* entry fee at this sponsoring retailer, and no purchase is required. Entries are restricted to one per hobbyist. Entered models must be primarily Citadel miniatures, must be riding a mount (including monsters) of a type legally described as an option in the relevant army book, and must be on a standard GW base appropriate to the model's size type (though customizing/decorating the base is encouraged, the dimensions must remain play-legal). Prizes will be awarded for Best Mounted Wizard and Best Dedicated Sponsor/Event Mounted Wizard: hobbyists who present with their entered model a valid receipt showing proof of purchase for that kit at the sponsoring retailer (Area 51) after the start of the Storm of Magic Event Series November 1, 2011 qualify for this additional prize from this month's sponsor, Area 51 Grapevine! Mark Pollet won his first Storm of Magic Event Series modeling contest with his entry in HobbytownUSA Dallas' February event, the Monster contest. Mark offered a powerful daemon as his entry. Chad Jones was runner-up with that most quintessential of fantasy monsters, a red dragon. Mark and Chad will collect their prizes from HTUD, as well as accruing benefits to their force in the climactic WHFB Storm of Magic Megabattle at Gunslinger Games. Meantime--March is Mounted Wizard Month at Area 51 Grapevine! Adeptus North Texas has been selected by Warlord Games to be a part of their pre-release playtesting of their upcoming World War II 28mm miniatures game: Bolt Action! Warlord already offers a tremendous line of 28mm WWII miniatures and vehicles under their Bolt Action line, usable for any extant gaming ruleset...but as they have done with their excellent Black Powder and Hail Caesar rules, Warlord is developing their own game for their offered WWII miniatures--to also be called Bolt Action! This ruleset has reached the playtest phase, and interested North Texas gamers will have the opportunity to help influence the game by their advanced playtest participation. Although official credits for Bolt Action will not be released until the game itself is publicly announced, veterans of previous generations of the Warhammer series of games, including Warhammer 40K, will recognize the design influences of such luminaries as Alessio Cavatore, Rick Priestley and Paul Sawyer. How do you take part? As Adeptus North Texas is being considered a 'club' for playtesting purposes, all potential playtesters will have to be subscribed to the Adeptus emailing list (if you are getting this announcement there, you are good! ); sign up from http://www.adeptusnorthtexas.com. Then watch for announced playtest games, and come test your mettle! Of course, once introduced to the game, participants may want to run additional playtests themselves. That, too, will be possible. And to facilitate the construction of initial forces necessary for play, Warlord have offered North Texas playtest participants the opportunity to build initial forces via their website--at a 20% off discount incentive! Once you've determined the starter force you would like to purchase, email it to me with product names/ID codes (anything you consider necessary information to determine you will get precisely what you want) at: Outrider@adeptusnorthtexas.com with the Subject: 'Bolt Action Order'. I will get back to you with your final cost, how to pay, when the order will be placed, etc. Bolt Action is a squad-based game; while there will be plentiful utility for ancillary forces as the game is published, to best participate in playtests, look at the basic infantry boxed set types and especially starter forces on the website. An armoured vehicle, transport and tank or two will certainly be viable parts of a playtest force but building said force around a core of infantry is likely to be most satisfying. This is a fairly unique opportunity to shape a ruleset--as well as get started on a force at a significant incentive discount!--so act quickly. There will be Bolt Action playtest games beginning soon at a retailer nearby in North Texas...and as Bolt Action has generously offered prize support, there will likely be a free Bolt Action demo playtest for paid Astronomi-con Dallas members, if the time and logistics can be managed! Bolt Action: WWII in 28mm. Coming worldwide soon from Warlord Games...but ready to commence battle in North Texas today! Mary Proffitt won her second Storm of Magic Event Series modeling contest with her entry in Texas Toy Soldier's January event, the Arcane Fulcrum Terrain contest. In fairness, it was a tie between Mary's throne of skulls terrain piece and Rick Morang's chaos vortex piece, with the terrain master himself, TTS owner Allen preferring the skulls (I liked the vortex, if it's any consolation :). Mary will collect her prize from TTS as well as accruing benefits to her force in April's WHFB Storm of Magic Megabattle at Gunslinger Games. Meantime--February is Monster Month at HobbytownUSADallas! To celebrate the opening of their new store, at 10534 Miller Road, Gunslinger Games will host an expansive miniature painting contest--hoping to fill their new display cabinet with beautiful wargaming models of every eye-catching variety! The 'New Model Army' Miniature Painting Contest is open to brand-new models of any sort--individual hero, cohesive unit, centerpiece vehicle or monster--with the only restrictions that the model be 'new' (see following), on a single-footprint base (meaning at least a movement or skirmish tray for units; vehicles may--but are not required to--be based, so long as unbased they still present a single footprint) and a part of a fieldable army in a wargame system (not just a decorative or ornamental model, in other words--a model that could actually appear in a tabletop wargame). 'New' in this context means a model finished in 2012. That can be a brand-new offtheshelf figure or kit, an unbuilt or unfinished model idle on a workstation for too long, even a once-complete work which has undergone a recent repaint; like GsG's new location, the submission just needs to be 'new' (and submittors are largely on the honour system here; GsG is encouraging you to build, paint and finish something new, to celebrate with them). Models submitted may be from any miniatures wargame played at Gunslinger Games; while that certainly includes Warhammer Fantasy Battles, Warhammer 40,000, Lord of the Rings, Space Hulk, Dreadfleet, Warmachine, Hordes, SuperSystem and Bolt Action, for example, GsG will special order virtually any model for any game system, including historicals; if you have wanted to try it, they will get it--and have the space for you to use it! So approach this event as an opportunity to get that new project underway. Gunslinger Games will award a Grand Prize of a GsG store gift certificate for the Best New Model Army Miniature entry, regardless of type. Runner-up Prizes for best models in individual categories may be awarded if there are sufficient entries--and to encourage submissions by hobbyists of all ability levels, *every entry* will be eligible for the Participation Prize, a GsG store gift certificate of *equal* value to the Grand Prize! Contest will continue through Memorial Day at the end of May 2012--but one of the things GsG wants from this event is to fill their new display case with eye-catching miniatures, so interested participants can begin submitting completed entries immediately. Submitting early will accrue the submittor a real benefit: each month an entry is on display will earn it one credit toward the random Participation Prize draw at event's end--so someone who gets their model to GsG's new location before the end of January and leaves it displayed will have five extra chances to win! GsG wouldn't mind selling some of the models hobbyists submit--certainly validating the entry's newness!--and so any entry purchased from Gunslinger Games, special order or offtheshelf, may be submitted *in addition to* the one per wargame system limit above. Additionally, such GsG purchases will accrue an additional entry in the random Participation Prize draw! Purchase receipt should be presented when the model is returned for display submission to validate it's eligibility for these bonuses. Join Gunslinger Games' celebration of their bigger, better and all-new store by putting your best new wargame element on display, at their 'New Model Army' Miniature Painting Contest--now through Memorial Day! February 25th, 2012, Area 51 Grapevine will host a four round Blood Bowl tourney...Bugman's Bowl II! The $20 per team registration fee can be paid online when participants register, or in person on the day of the tournament (online registration still required). There will be giveaways, prizes and souvenir T-shirts. Any questions can be directed to Commissioner Jason via email or through the website directly at bugmansbowl@gmail.com. Pound the pitch Warhammer Fantasy style at Bugman's Bowl II! January 2012: Texas Toy Soldier -- Storm of Magic Arcane Fulcrum Painting Contest: Participants may submit an Arcane Fulcrum Terrain objective model of their choice any time from January 1, 2012, through close of business Saturday, January 28, 2012, where submissions will remain on display through January 31. There will be an entry fee of $5 per participant, but there is no limit on the number of entries a participant may enter at that fee. Models entered must be primarily Citadel Arcane Fulcrum kits, other Citadel Terrain kits converted to act as a Storm of Magic Arcane Fulcrum objective (see SoM supplement for details), or other qualifying Terrain kit purchased from Texas Toy Soldier and so converted (only non-Citadel Terrain kits entered need be TTS purchases, but see following). Prizes of Texas Toy Soldier gift certificates based on the amount raised by entry fees will be awarded--and TTS will double the amount of entry-fee-generated prize money! Awards will be given for Best Arcane Fulcrum, Best Conversion and Best Dedicated Sponsor/Event Arcane Fulcrum: hobbyists who present with their terrain piece entry a valid receipt showing proof of purchase for that entry at the sponsoring retailer after the beginning of the Storm of Magic Event Series November 1, 2011, qualify for this additional prize from this month's sponsor, Texas Toy Soldier! Winners will be announced in store and at http://www.adeptusnorthtexas.com in February 2012.